Though U.S. Olympic figure skater Mirai Nagasu failed to replicate the history-making triple axel that she had completed during the team event when she performed in individual competition, she’s cool with finishing far off the podium. In fact, if you were wondering why she seemed so giddy throughout most of her otherwise disappointing free skate, we now know that she was just scheming the whole time. “I smiled in the middle of my program, which is very rare for me. I thought of this as my audition for Dancing With the Stars,” she said after the competition. 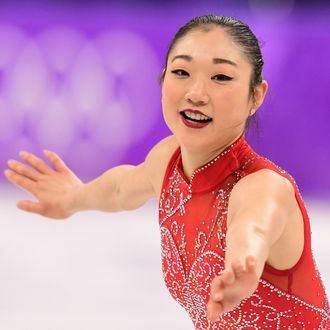 “I would like to be on Dancing With the Stars because I want to be a star.” It’s a wish fulfilled by many other Olympians before her that Nagasu has been vocal about many times, even tweeting that she’s cleared her college schedule to make herself available. A triple axel mid-ballroom dance? Your fave could never!